The Sixty Best Episodes of XENA: WARRIOR PRINCESS (11 & 12) | THAT'S ENTERTAINMENT! With all that said, let us resume with episodes 11 and 12 on the list. The episode opens with Xena and Gabrielle traveling though a smokey forest in the middle of a civil war between the Mitoans and the Thessalians. They find a wounded and very pregnant Ephiny, who tells the pair that her centaur husband was killed by Mitoans during the crossfire. Xena vows to stop the war and takes down a Mitoan general with her chakram. She gives him a serious wound and takes both Ephiny and Marmax, whom she strips of his rank, to a Thessalian healing temple. As Xena begins healing the wounded inhabitants, Hippocrates and Democrites are impressed with her skill, much to the chagrin of their mentor, head priest Galen, whose medical knowledge relies solely on praying to Asclepius. 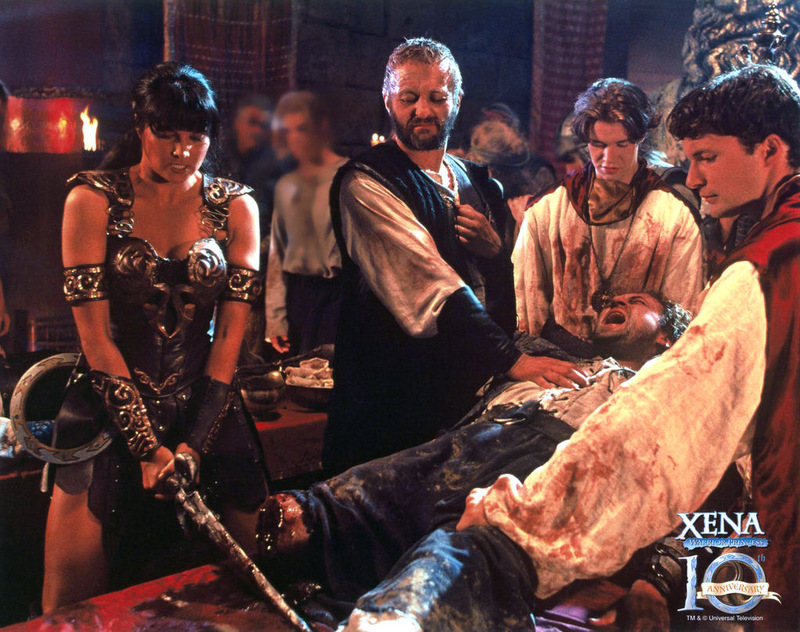 Gabrielle bandages Marmax, and the two assist Xena in the amputation of a man’s leg. But not all of Xena’s patients are savable. Gabrielle leaves the temple to find a wounded soldier’s son and Marmax attends to Ephiny, who reveals to the General that her husband was killed at the hands of a Mitoan. The moment is interrupted when Gabrielle is brought in on a stretcher, and as Xena tries to save her, the temple goes under attack. While leading people out of the temple, Democrites is shot with an arrow and Galen begs Xena for help. She removes the arrow and delivers Ephiny’s breach centaur baby with a C-section. Mitoans charge the temple but Marmax, finally recognizing the suffering that the war has caused, orders that the fighting come to an end. Just then, Gabrielle has a seizure and her heart stops. A desperate Xena tries to revive her friend, breaking down and pounding on her chest until Gabrielle revives. Later, Hippocrates expresses his gratitude towards Xena, as does Marmax, and she and a recovering Gabrielle finally leave the ruined temple. This excellent episode contains one of Lucy Lawless’s best moments from the entire series: her meltdown when Gabrielle nearly dies is riveting. The silence is incredibly powerful and Lawless’s performance is extraordinarily raw. After a season of playing Xena very stoic and composed, this complete breakdown loosens not only the actress, but the character as well. It’s almost a crime that Lawless was never nominated for her work on this series — especially for an episode like “Is There A Doctor In The House?” Meanwhile, the episode’s anti-war message comes in loud and clear — almost TOO loud — but the medical stuff is incredibly engaging and probably is more powerful than all the lecturing Marmax and the viewers are verbally given. Though there’s little action on the battlefield, the action in the temple more than makes up for it, infusing the episode with even more tension than in a normal Xena. This is a phenomenal 44 minutes and will probably impress new viewers. It’s an atypical show, but expertly done. “When In Rome…” is the first Post-Rift episode to really address and continue the storyline. Writer Steven L. Sears once again uses Xena’s hatred for Caesar to explore and develop Gabrielle’s character. (He does this in “The Deliverer,” “A Good Day,” and “Endgame,” as well.) It’s actually very effective, because while the action is centered upon Xena and her past — as it should be — Gabrielle is pushed farther and farther to the woman she becomes in Seasons Five and Six. In addition to being an excellent episode for both characters, it’s incredibly well-written with a memorable sequence in the Colosseum. When Caesar captures Vercinix, a warrior from Gaul, Xena and Gabrielle go to Syria and capture Crassus. The plan is to trade Crassus for Vercinix. Xena and Gabrielle bust into Caesar’s palace with Crassus’s imperial ring — proof that he’s in their possession. Caesar is unconvinced that the prisoner is alive, so Xena escorts him to Crassus. 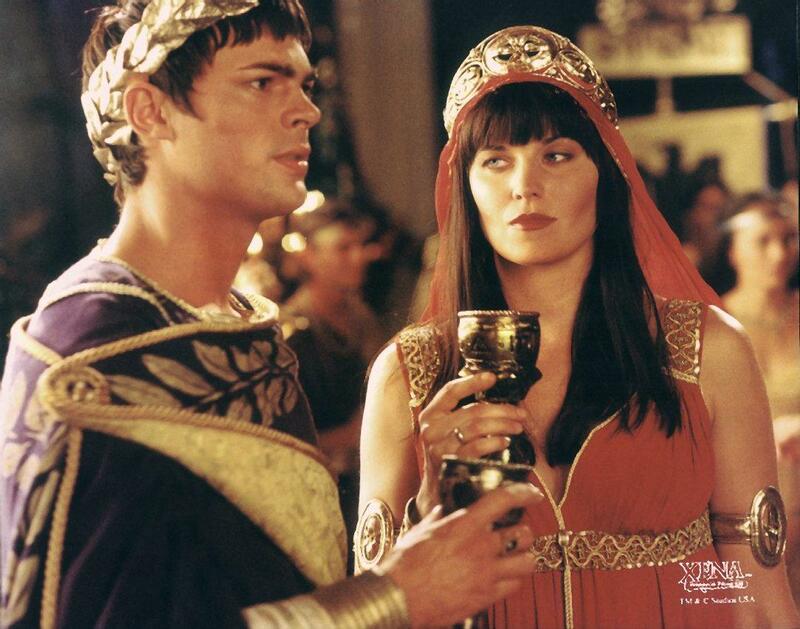 After Caesar urges Crassus to manipulate Gabrielle, Caesar demands that Xena accompany him to a gala that evening. Meanwhile, knowing that Caesar won’t go through with the trade, Xena and Gabrielle devise a plan to switch Vercinix and Crassus without Caesar’s knowledge. Gabrielle isn’t totally onboard, fearing that Crassus might die as a result of her actions. Xena is unsympathetic, especially after Caesar announces at the gala that Vercinix is to be executed the next day. Xena visits Vercinix in his cell and makes a mold of the key. Meanwhile, Crassus tries to guilt Gabrielle about her responsibility in his impending death, but Gabrielle tells him that she will give him his imperial ring, which will identify him to the guards and spare him from execution. She spikes his water with a drug and has them both arrested in Rome for public drunkunness. That evening, Xena is arrested for attempting to assassinate Caesar with a knife given to her by the devious Pompey. As Xena connects with Gabrielle and Vercinix in the prison, Crassus sleeps. The next day Caesar bitterly returns the knife to Pompey. In the Colosseum, Xena’s death is planned as the opening act to Vercinix’s execution. 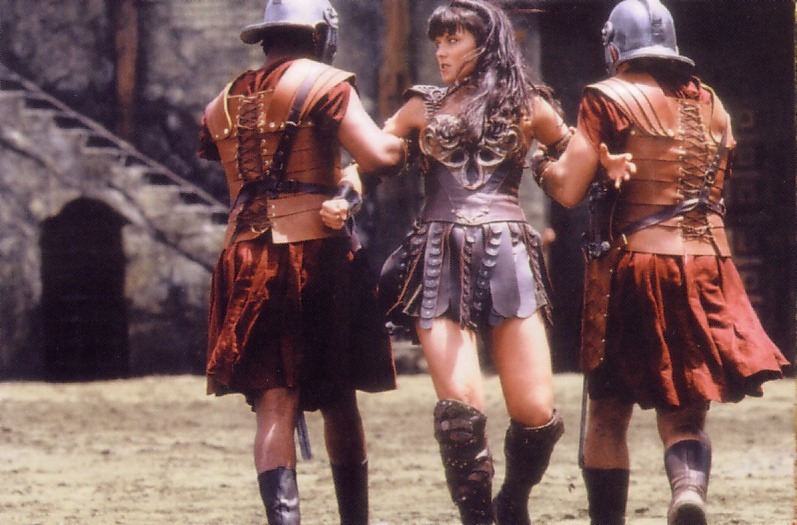 Xena stalls the soldiers while Gabrielle does the exchange. But when Vercinix reveals that the sleeping Crassus was personally responsible for the death of many women and children, Gabrielle decides not to return him his ring. Xena defeats the men, and Gabrielle watches as Crassus is brought out and an angry Caesar has no choice but to order the execution. After freeing Vercinix, Xena and Gabrielle talk about the latter’s role in Crassus’s death. Xena feels guilty, but Gabrielle lets her know that it was her own choice. The two profess their love and Gabrielle drops Crassus’s ring into the sea. This episode is incredibly well-written with a mature story and sharp dialogue. Once again, Xena deals with her greatest enemy: Caesar. The episode does a nice job of keeping her motivations gray — does she really intend to kill Caesar? Obviously, Xena was just engineering her arrest, but the hatred for him is deliciously apparent, and one secretly hopes that she will strike — just to see that evil gleam in her eye once again. But like “The Deliverer,” the episode is really about Gabrielle. She plays “judge, jury, and executioner,” when deciding that Crassus should die. This is the third time that Gabrielle has let someone die (fourth, if you count her responsibility in Solan’s death) and the first that she really could have saved someone. (Hope doesn’t count — Gab finally realized that the child HAD to die.) The character’s moral development is brilliant here and really makes the episode A+ viewing. Really sharp stuff. Come back next Thursday for number 10! And don’t forget to check back tomorrow for another Film Friday post! Pingback: THE XENA SCROLLS: An Opinionated Episode Guide (123 & 124) | THAT'S ENTERTAINMENT! Pingback: THE XENA SCROLLS: An Opinionated Episode Guide (315 & 316) | THAT'S ENTERTAINMENT!